I follow some pretty amazing refashion bloggers that know their way around a DIY and can turn old clothes or ugly thrift finds into fashion forward and stylish pieces. Some of my favorites are listed below. Enjoy! 1. a pair & a spare makes awesome stuff. The end. 2. ChiChi Loves is a budding seamstress, fashion stalker, city frolicker, shoe hoarder, domestic diva, self professed people watcher, and closet dancer. 3. Create / Enjoy providing DIY for a happy life. 4. 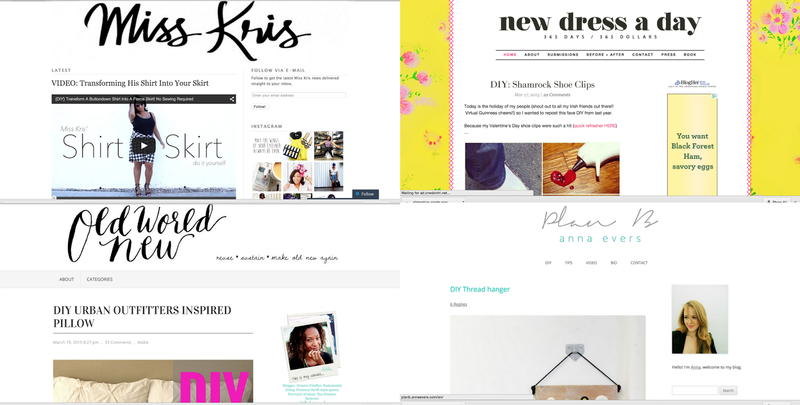 Creative & Co. is a nurse with an obsession for organization, blogging, and beauty and fashion on a budget! 6. Little Did You Know refashions her closet and herself one piece at a time. 7. M. Nicole Blog spreads her passion for refashion by teaching classes. 8. Merrick’s Art is a stylist who knows her way around a needle and thread. 9. Miss Kris Turner is glitter, glue, glamour and so much more! 10. New Dress A Day made 365 dresses for $365 in 365 days. 11. Old World New makes new out of old. 12. Plan B anna evers is a passionate crafter from Denmark but grew up in the Dominican Republic and currently living in Barcelona Automatic cool. 13. ReDpants Designs wears red lipstick, sews red stitches, has red haute style. 14. riva la diva loves leopard, sparkly and shiny things. 15. 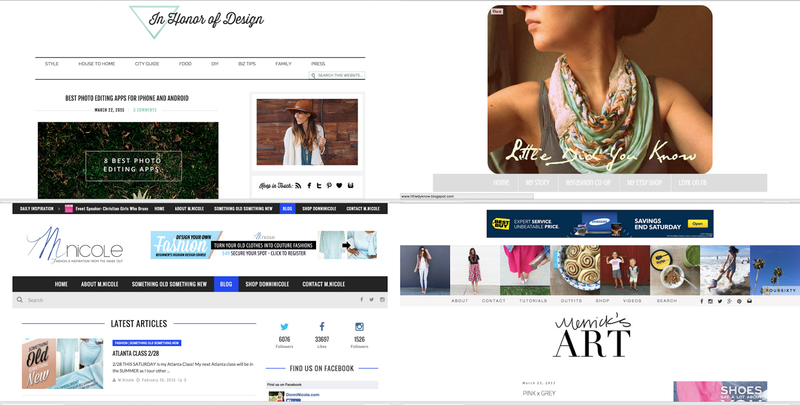 Runway DIY takes fashion and style trends from the runways and the pages of magazines and makes them accessible. 16. Sweet Leigh is a self taught milliner, designer and cinephile among other things dedicated to the sweet and saucy life. 17. The Felted Fox is Scandinavian minimalism, Californian modernism, and a little bit of a South African love for color and all things recycled. 18. The Merrythought is a a trio of creatives in Western New York. 19. The Refashionista with a name that says it all! 20. Wardrobe Recycle it’s in Greek but so worth turning Google translate on for. 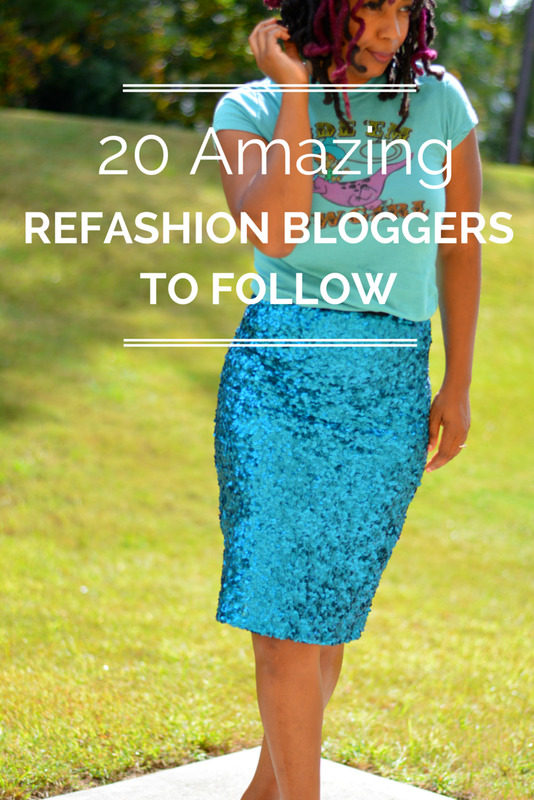 Tell me your favorite refashion bloggers and I'll add them to the list! Heard of just five of these and agree they do some amazing work. Thanks for sharing the others too - always love to find more refashionistas out there! What a great list! thanks so much for the inclusion. <3 IT! Thanks for adding me to an awesome list of bloggers. I follow a lot of them and they're all so inspiring.